I want Dental Implants, but I’m missing a lot of bone, what are my options? In the past the answer was nothing. If you were missing bone your dentures would become loose and you had to accept the reduced quality of life that came with that. Thankfully, now there are many things that can be done. Many implants used to be 15mm or longer to anchor them as strongly as possible to the bone. It was discovered that the extra length didn’t add much strength and so shorter dental implants can be placed in many cases to avoid the need to bone graft. Some dental implants can be as short as 5mm, although 9mm is the most common. Some very short implants can be placed to avoid nerves and other important structures where before nothing could be done for a patient. Ask about our short Biohorizons or Bicon dental implants of you have previously been told that you cannot have dental implants because of short bone. When you lose a tooth, there can also be bone loss. The longer the tooth is missing, the more bone loss that will occur over time. Bone loss can impact different people in different ways and the wearing of a denture can accelerate the amount of bone lost. In cases of significant bone loss, there may not be enough bone left to place a dental implant. If this occurs, it is necessary to perform a bone graft. More often than not, this is a simple procedure which can be carried out under local anaesthetic. However, in more severe cases it may involve going to the hospital for treatment under general anaesthetic. Following your initial assessment, we will measure your bone by using a dental CT scan. There are several ways in grafting bone, all of which will result in some minor swelling for a week or two, but very little pain. Any swelling can be reduced with some medication and following your personalised aftercare instructions. This occurs when the sinus has expanded and results in bone being lost. This tends to happen in the upper jaw towards the back, by the maxillary sinuses which are located close to the mouth. Once a tooth is lost at the back of the top jaw, over time the sinuses can expand into this area and results in bone rapidly becoming resorbed. When this happens, there can often be too little bone to place implants and a sinus elevation would be required. An internal sinus graft is performed when the implant is being placed and using the same hole as the implant. This method is far quicker than an external sinus graft, meaning less swelling for you. This treatment is usually carried out when there is still more than 5mm of bone remaining between the mouth and sinus. An external sinus graft involves lifting the gum at the side of the sinus and placing a bone substitute into the area created. Once the graft has matured, we then place the dental implants six months later. This procedure is incredibly common and takes about an hour to complete. As it is a surgical procedure, some swelling and soreness may occur afterwards. In many cases sinus grafts are essential prior to the placement of implants at the back of the top jaw. They do require more time to mature, which can result in a longer treatment completion time and do involve an additional fee. Your dentist will only know if you require a sinus graft once an appropriate x-ray has been taken. In some cases the bone may be soft but not wide enough to correctly place an implant. This can be rectified by gently expanding the bone and does not result in any bruising or swelling. In areas where a large amount of bone is missing, it may be necessary to take some bone from elsewhere and move it the the area which needs it the most. However, this approach is uncommon, as it can lead to discomfort and is only used on incredibly rare occasions. In some cases we can avoid grafting altogether, by slightly moving the nerve in the jawbone. This allows for implants to be placed faster than if a graft were place. This can sometimes result in a temporary lose of sensation in the lower lip, but will almost always return with no long term effects. There are a wide range of bone graft materials available. Some are artificial and made of calcium and phosphorous, where others come from bovine sources. These granules are placed under the gum and allowed to heal over several months, resulting in a foundation strong enough to support implants. 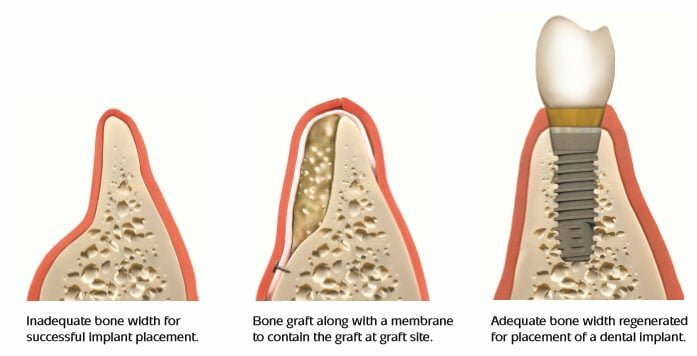 In cases which only require a small amount of bone grafting, it is possible to place the implant at the same time as the graft.